Legendary Christian evangelist Billy Graham turns 95 years old on November 7. And on that night the country will get a televised special from the man who, in his heyday, was referred to as America's pastor. The reason I say in his heyday is because, obviously, he hasn't been as active, vocal, or even made many public appearances over the last several years due to his age and frequent health issues. However, that hasn't stopped U.S. presidents and presidential candidates, as well as many of the country's other most influential people from seeking his counsel. But are young people today interested in what Rev. Graham has to say? We'll find out when "The Cross" airs Thursday, November 7. It's part of the "My Hope America with Billy Graham" initiative that culminates this month. "My Hope America" is Rev. Graham and his Charlotte-based Billy Graham Evangelistic Association's (BGEA) "effort to reach people across the United States with the Gospel of Jesus Christ. Following a simple biblical model, [it] combines the impact of video programs with the power of personal relationships. Christians across America will open their homes this November to share the Gospel message with friends, family, colleagues, and neighbors using one of several new evangelistic programs featuring life-changing testimonies and powerful messages from Billy Graham," according to its website. "The Cross" television special will feature scenes from an evening event with Rev. Graham that took place last week at The Billy Graham Library. In this minute-long trailer for the special, it's clear that they want their message to reach young people. It, for example, features Christian hip hop artist Lecrae (did you know there was such a thing?) and rocker-turned-Christian-singer Lacey Sturm. An article published by Reuters yesterday gives an insightful look into what the Grahams, including the elder's son Franklin, are seeking to accomplish with "My Hope America." The article briefly describes the impact Rev. Graham and BGEA have had over the last seven decades but also cites studies such as a 2005 Gallup Poll that "revealed that 45 percent of young adults were not familiar with Billy Graham. And one third of adults under 30 consider themselves religiously unaffiliated, according to a 2012 Pew Research Center report." Also as a part of "My Hope America," as the article points out, Christian believers from more than 24,000 U.S. churches will invite people into their homes and congregations to learn about their faith from Rev. Graham. 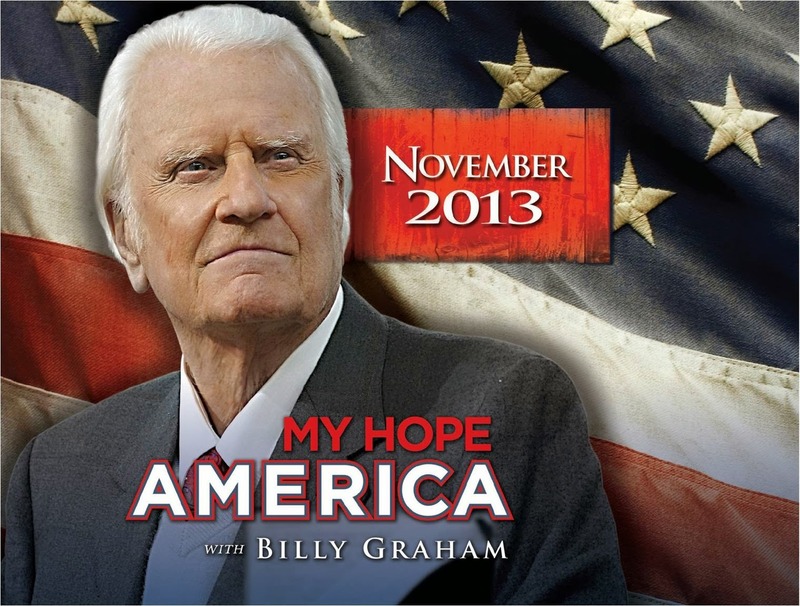 Visit myhopewithbillygraham.org for more details, and watchbillygraham.com for TV listings for the special. "The Cross" is scheduled to air nationwide on FOX News on November 7 at 10 p.m. It will also be broadcast on several faith-based networks as well as local TV stations around the country over a four-day period, including November 8, 7:30 p.m. on WBTV, Charlotte's CBS station.